Another piece of yardage I brought home from California made it to the top of my list this week. When I bought the fabric, a luscious double-layer fabric that’s comprised of a sheer black knit and what looks like your favorite old comfy gray t-shirt gone all wabi sabi on you (thanks, Nancy Shriber, for the term), I had no idea what it wanted to be. When I first picked it up off the counter, I thought it would make a great extended front for an old Eileen Fisher boiled wool jacket I had dyed black. But the more I gazed at the fabric and the jacket, I was having no epiphanies. I’ve never seen a fabric like this. The two layers appear to be fused together. Random three-pointed stars are stitched through the two layers and the top layer pulled away and cut around the stitching. The t-shirt fabric then rolls a little to the right side. It has a mola or Alabama Chanin stitch sense to it. I got the fabric from Marcy Tilton—alas, it appears to be sold out. A week or so after I got home, Katherine Tilton blogged about the wardrobe she was compiling for her week at Puyallup. (Photograph—at right—©2013 Katherine Tilton) Guess what was at the top of her list. Yep, that fabric. Katherine chose to use her Vogue 8793 (which I made up while I was at DOL Santa Barbara and blogged about recently). But the fabric Katherine paired with the stars blew me away. I had a bit of that fabric left over from my first take on Katherine’s Vogue 8817, and already knew I loved the burnout stripe. So I jumped over to Marcy Tilton’s fabulous fabric store and grabbed some more. Once I got the various pieces cut out and assembled, I was almost finished with the top. However, I had looked at the topstitching on Katherine’s top, and longed to add a bit of that to mine. I love delicate and precise handstitching, but when I did a couple of test samples, I wasn’t pleased with how mine was coming out. For me, the double-layer knit didn’t lend itself to my topstitching. Did that lessen my love for the top? Not on your life. I put the top on, slipped on a pair of black leggings and my little Eileen Fisher ballet flats, and out the door I went to take granddaughter to dance class. Another winner from the brilliant team of Katherine and Marcy Tilton. Final note about these t-shirt patterns Marcy and Katherine have available on the Vogue website. They are simple and elegant, and go together in a jiffy (or gypsy, as my now-adult sons said when they were little). I started this one Easter Sunday morning hoping to get it finished in time to wear to the matinee of “The Book of Mormon” in Pittsburgh that afternoon. I missed by less than an hour. You just can’t go wrong with these patterns. Photo disclaimer: Today was the first really spring day we’ve had, and the wind was trying to prove a point. My photographer thought you’d enjoy seeing the crocuses. Another of Marcy Tilton’s “Cool Combos” that came home from California with me was a bundle of gray and black stripes—one with the stripes about ¼ inch wide, one with narrower stripes, and one with sheer black stripes and abstract gray stripes. 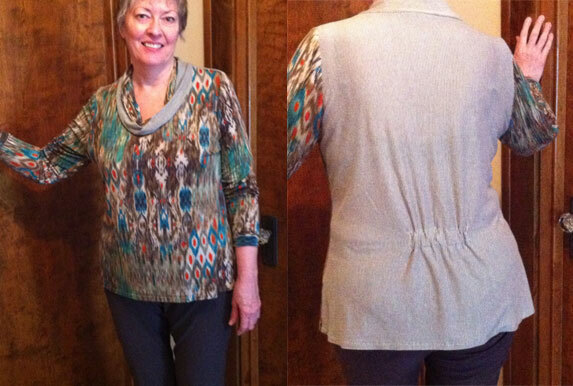 The pattern I chose was another of Katherine Tilton’s tops—this time Vogue 8817. I liked the sheer stripe so much I decided to use the sleeve from view A/B, but without the trim strips. For the body I used view C. On the middle stripe on the upper front, I used the sheer, but doubled it (cut two of the pattern piece and layered them) so my bra strap wouldn’t be so visible through the fabric. Laying the pattern pieces on the fabric to try to make the stripes meet on the side seams took me a long time. I need to figure out a better way to make sure the stripes are straight on the fabric. But my work paid off—I was very pleased with how they matched. But the part of this top that I am the most excited about is the binding on the neck opening. I had heard Marcy talk about this treatment, but had never tried it. I cut the binding strip along the selvedge, which had a rough, fringy edge. Instead of sewing it on the outside and wrapping to the inside, I sewed on the inside, wrapped to the outside, and topstitched a ¼ to an ⅛ inch from the selvedge edge. Because I’m working with a knit, I don’t have to worry about fraying. I have a decorative edge at no extra cost. I’ve been sewing since I was 13, and it’s great fun, almost 50 years later, being able to draw upon a lifetime of experience to quickly and easily make a new top that would probably cost me $100 in a high-end boutique. I just completed my first knitting project since I broke my wrist on 11/30/2012 and had surgery to install plate on 12/7/2013. I follow The Buffalo Wool Company on Facebook. A month or so before my Fateful Fall, Buffalo Wool Company posted a picture on FB of a skein of their hand-dyed “Tracks” in a color they call Black Bunny 2, a wonderful mix of shades of blue, aqua, and lime. Tracks is comprised of mostly superfine superwash merino, with a little bison for warmth and strength. This yarn is soft!! I ordered a hank of the yarn, 400 yards. It was placed in my mental knit queue to follow the ruffle scarves I was knitting for my grandchildren’s Montessori teachers’ Christmas gifts. And then I fell and wondered if I’d ever knit or play piano again. In January, during my two-month stint of sitting on the couch all day every day, I received my weekly email from nearby Wolf Creek Yarns. They posted a photo of the Madelinetosh Honey Cowl, and I thought it might be the perfect pattern for my hank of Tracks. In early February I cast on the cowl. I tried for several days—my wrist still in a brace—and could only knit 50 or so stitches before the pain would be too great to continue. I would try again every few days, but could never get much more than 50-100 stitches completed before I had to quit. Then in mid February I graduated from the brace and began physical therapy. Well, guess what — my doctor considers knitting to be good therapy for strengthening a broken wrist. Yea! I knitted five or so rows every night while watching television. Last week I made a big push to get this thing done so I could move on to other projects. Over the weekend, I finished my new cowl. It perfectly complements the cashmere sweater given to me for Christmas by DBF. This cowl will be to me—forever—a symbol of progress and accomplishment. Why “Honey” Cowl? The pattern is knit one row; [purl 1, slip1 wyif] for one row, knit one row, [slip1 wyif, purl 1] for one row. The slipped stitches give you a pattern that looks like honeycomb. Love it! Fabric Used: Purchased from MarcyTilton.com, it is now sold out and I am not positive about the fiber content. I believe it is rayon/lycra. It’s absolutely yummy with great stretch. The companion stripe has less stretch, so has to be cut accordingly. Marcy and her team frequently post “Cool Combos” – a yard or so of several fabrics that they like together. Kudos to the team, all of whom have great eyes for the mix! Needle/Notions Used: Standard 10 or 12. A little 1″ strip of fusible knit interfacing to stay the shoulders. Tips Used during Construction: I made this shirt during one of Marcy Tilton and Diane Ericson’s Design Outside the Lines workshops and was bulldozing my way through to get it done before the end of the workshop. It goes together quickly. Did it look like the photo or drawing when you got through? Yes – considering my modifications. How were the instructions? The only instructions I referred to were for the double collar. I changed these as noted below. Everything else was straightforward T-shirt construction. Shoulder, sleeves, neckline, side seams including sleeve, hems. Ta-daa. Likes/Dislikes: I love the interesting collar and adore the fabric! Will be making more of these. Conclusion: This is another very good, flexible top from the sisters Tilton. You could make this top ten times and no one would recognize they’re all from the same pattern. Oops! So glad I wrote this post and had the Jazzman take the pictures for me. Now I realize that the fabric on the back is thin enough for my black bra to show through. Won’t make that mistake again! Look at those two photos. If you saw that mass (or mess) of yarns on the left sitting in a pile, would you have any idea that the finished product would look like that infinitely touchable baby blanket on the right? Nope, me neither. I went into Fine Points Yarn Shop on Larchmere in the Shaker Heights neighborhood of Cleveland shortly after my birthday. They had sent me a quite generous birthday discount offer, and I was determined to use it! My daughter-in-law has suggested that I make a baby blanket or two for her photo studio. She thinks her brides from a couple of years ago, who are now having babies, would be interested in purchasing one of my blankets for their photos shoots with the new babes. So I asked what the ladies at Fine Points might suggest for such a project. The clerk who was helping me led me upstairs to the baby and child room. 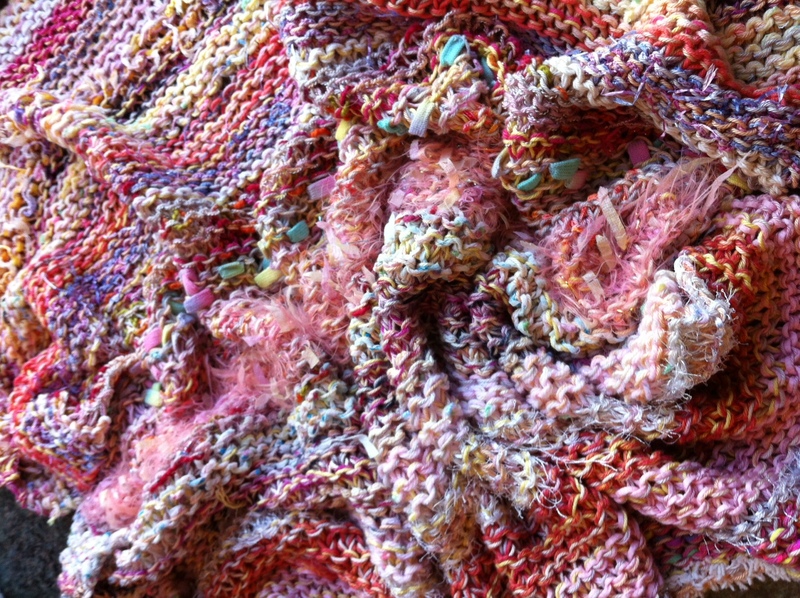 When she showed me that pile of yarns, all wrapped up in a plastic bag with a pattern that said “Oh, Pretty Baby: A Baby Blanket Using Bits,” I wasn’t so sure. After purchasing it and scheduling it as my next knitting project, I wasn’t so sure. But 10 rows into it? I was smitten! The price on the kit was higher than I wanted to spend and the finished project would be higher, I thought, than a new mom would want to pay. Luckily, my spousal equivalent just acquired a brand new great-niece. Guess who’s getting a blanket? Cora is, that’s who. The pattern couldn’t be simpler. Cast on 95 stitches. Use the base yarn—Schachenmayr Crazy Cotton (the kit used color #82)—throughout. 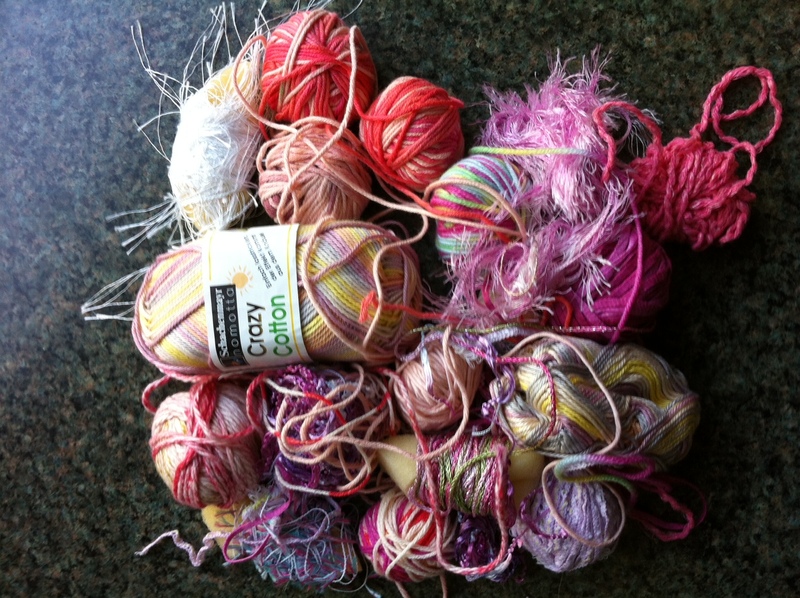 At all times, hold a second yarn, picking up one of the “bits” – the random small balls of yarn. The “bits” can be eyelash yarn or a similar novelty yarn, or they can be chenille or bumpy or, really, whatever. They give the interest to the base yarn. The stitch? Garter stitch throughout. Knit every stinking row. Just keep knittin’. Couldn’t be easier. After a lot of television shows and audio books, the blanket was finished. (The pattern suggests knitting to 30″. I wish I had gone a little farther, as it’s not quite square.) It’s beautiful. And soft. A nice weight to throw over the baby in the crib or as she’s riding in her stroller. I threw it into the washer on the hand-wash setting, then into the dryer on a similar setting, then, while still damp, laid it flat on a table to finish drying. I can’t wait to hear from Cora’s mom when she receives it. It’s truly a one-of-a-kind gift.